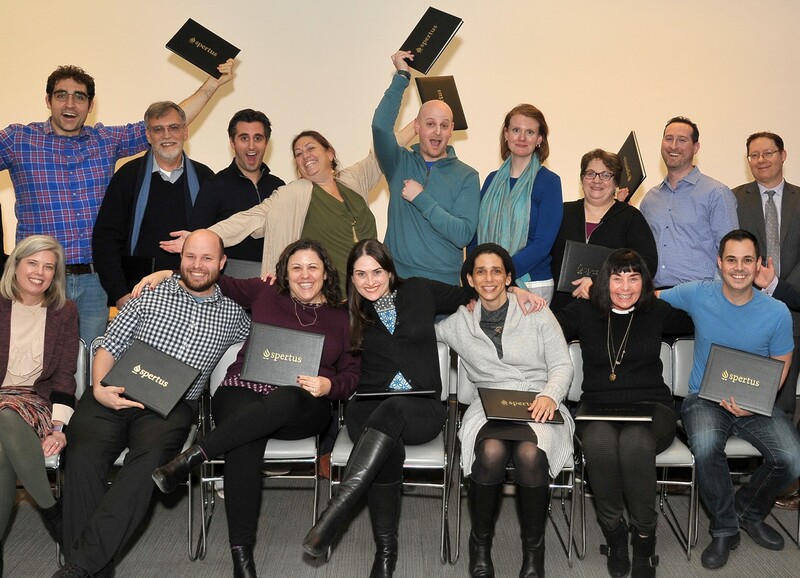 Presented by Spertus Institute in partnership with Northwestern University, the Certificate in Jewish Leadership enhances the professional abilities of Jewish leaders. Traditionally, Jewish leadership programs have focused on management skills or Jewish literacy. In this program, leadership training is taught organically within a Jewish context. The program is for established and emerging leaders (including lay leaders) working with Jewish organizations. Newly promoted managers and directors have found the program particularly beneficial. To make participation available to participants worldwide, the program is presented through a combination of online content and onsite seminars at the Spertus Institute campus in Chicago (one seminar in the fall, one in the spring). Taught by senior Northwestern University and Spertus Institute faculty, the program concludes with one-on-one mentoring sessions with established community leaders. The full cost of the program is $2,500. This includes the Leadership Assessment and Mentor Match, but does not include travel or accommodations. Scholarship opportunities may be available for qualified employees of Jewish organizations. Inquire to find out more. This is a selective enrollment program. Applicants should have five or more years of professional experience, a bachelor's degree or the equivalent, and a strong commitment to developing and fulfilling their professional potential. Interested in finding out if this program is right for you? The curriculum is a four-course sequence, including a one-on-one mentorship and followed by a capstone conversation. Participants proceed through the curriculum as a cohort, which provides opportunities for peer learning and networking. Preeminent university recognized as a hallmark of academic excellence. Provides exceptional opportunities for intellectual, professional, and personal growth. Instructors with outstanding academic credentials and relevant professional experience create highly interactive and collaborative learning environments. Students study with peers who have rich, diverse backgrounds and can provide lifelong connections. Long and rich history of innovative programming that serves the needs of Jewish educators and communal professionals. Diverse, non-denominational offerings are grounded in Jewish thought, inspired by Jewish values, and resolutely relevant to contemporary life. Graduate-level degree programs, professional certificates, and workshops blend theory and practice and are taught by leading faculty with real-world experience. Serves students around the globe through on-campus and distance-learning programs. Back row left to right: Derek Greeley, Adath Emanu-El, Mount Laurel, NJ | Max Preschel, Confederacion de Asociaciones Israelitas, Caracas, Venezuela | Kyle Stone, Illinois Department of Public Health, Chicago, IL | Rabbi Elyse Wechterman, Reconstructionist Rabbinical Association, Philadelphia, PA | Michael Schneider, Congregation Solel, Highland Park, IL | Abigail Salisbury, Temple Sinai, Pittsburgh, PA | Rena Boroditzky, Chesed Shel Emes, Winnipeg, Manitoba | Levi Zeffren, NSCY, Chicago, IL | Dr. Dean P. Bell, President and CEO, Spertus Institute. Front row: Erica Wilke Bova, Assistant Dean, Northwestern University's School of Professional Studies, Evanston, IL | Moshe Lencer, Alpha Epsilon Pi Fraternity, Indianapolis, IN | Rabbi Janice Elster, Beth Sholom Synagogue, Toronto, Ontario; Michelle Lawner, JUF/Jewish Federation, Chicago, IL | Justine Saidman, PJ Library and Jewish Writers’ Festival, Sydney, Australia | Lynne Lieberman, Friedman Commission for Jewish Education, West Palm Beach, FL | Doug Winkelstein, BBYO, Chicago, IL. Not pictured: Laurence Bolotin, Zeta Beta Tau Fraternity, Chicago, IL | Margaux Friend, Lakeside Congregation, Highland Park, IL | Ariel Lapson, Ta’am Yisrael, JUF/Jewish Federation, Chicago, IL | Michael Markman, Spertus Institute and PwC, Chicago, IL | Susan Solomon, Sinai Congregation, Chicago, IL. Left to right: Rabbi Anna Levin Rosen, University of Chicago Hillel | Alec Ross, Youth Centers of Israel/Keren Yaldenu | Betsy Gomberg, Spertus Institute | Peter Bensinger, Sr., Morneau Shepell | Jane Charney, Jewish Community Relations Council | Jason Peltz, Bartlit Beck Herman Palenchar & Scott LLP and Trustee, Jewish United Fund | Dr. Linda Mathias Kaskel, Trustee, Jewish Reconstructionist Congregation | Silvia Testa, NBC Universal Hispanic Group and Women’s Network, NBCU | Not pictured: Allan Bogan, BBYO | Sherrie Weiss, Trustee, Florence Melton School of Adult Learning and Friends of the IDF | Troy Zukowski, Choices for Change and Trustee, Temple B’nai Israel. Mentoring is a unique and essential aspect of this program. Each CJL Fellow is assigned a professional mentor who has extensive senior-level Jewish leadership experience. Mentors work closely with participants to identify areas for professional growth, discuss professional challenges, and help foster professional application of the program's content. Mentors to date have included key executives and trustees of major Jewish Federations, foundations, schools, social service agencies, camps, media outlets, museums, and consultancies.